The Handbook of Coniferae, by Dallimore and Jackson, has proved its usefulness as a standard work on conifers for many years. Forty-two years have elapsed since the publication of the first edition and seventeen years since the third edition. In 1954, a reprinting of the third edition gave Mr. W. Dallimore the opportunity to insert a chapter on Metasequoia glyptostroboides, without revising the rest of the book. His death in 1959 precluded the possibility of another revised edition being produced by one of the original authors. Since the last edition was published, new species have been described and taxonomic and nomenclatural studies have necessitated changes in classification and in the use of many names. Even old familiar names of garden varieties required a new format, since the adoption of the term' cultivar' in the International Code of Nomenclature for Cultivated Plants. The last edition was divided into three sections, each of one family; Ginkgoaceae, Taxaceae, and Pinaceae. The recognition of a larger number of families necessitated some rearrangement. Placing all the genera in alphabetical order instead of in families should make them easier to find than if a family arrangement had been adopted. Botanists are by no means unanimous in the classification of certain genera. For example, some would place Cephalotaxus in the Taxaceae, whilst others consider that this genus should be placed in a separate family, the Cephalotaxaceae. 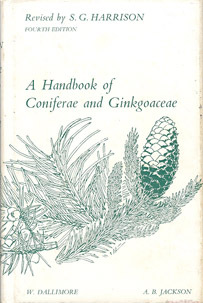 In generic and specific nomenclature and the names of authors, I have followed the Kew Hand-list of Coniferae (1961), as far as possible. All specific epithets and the names of botanical varieties have been decapitalized, as was recommended in the International Code of Botanical Nomenclature (1961). The use of capital initial letters for the names of cultivars or garden varieties, and their inclusion in inverted commas, serve to emphasize their distinction from botanical varieties and should lead to less confusion between these two categories. Names of countries which have been changed since the publication of The Times Atlas of the World, 1955-1959, have not been adopted, because many readers are unlikely to have access to more recent detailed maps and the bulk of the literature relates geographically to the older names. Several necessary additions have been made to the list of Principal Works Consulted in the Preparation of this Handbook, but, as in previous editions, this is intended to be an introduction to the literature rather than a comprehensive bibliography. I am indebted to Sir George Taylor, Director of the Royal Botanic Gardens, I, Kew, for enabling me to start this revision, and to the Past-President of the Council, the late Rt. Hon. Lord Raglan, and the Council of the National Museum of Wales, for granting me facilities to complete it. For information, advice, and assistance in various ways, I am indebted to many people, but particularly to Mr. A. F. Amsden, Dr. S. Batko, Dr. B. K. Boom, Mr. A. A. Bullock, Prof. L. C. Chadwick, Mr. D. L. Clarke, Miss E. Dallimore, Prof. R. Florin, Prof. J. do Amaral Franco, Prof. H. Gaussen, Dr. Netta E. Gray, Mr. H. G. Hillier, Dr. F. N. Howes, Dr. C. E. Hubbard, Mr. D. R. Hunt, Prof. J. Lanjouw, Mr. J. Lewis, Dr. R. Melville, Mr. A. Mitchell, Miss B. L. Price, Mr. J. C. Rogers, Mr. H. J. Welch, Mr. A. Westall, and Miss B. J. Youngman. Mr. H. R. W. Herbert has embellished the text with additional drawings, all except one (Cathaya argyrophylla) drawn from life.